British art duo The Connor Brothers are teaming up with Professor Green to shine a light on male mental health and to raise funds for the Campaign Against Living Miserably (CALM), a charity dedicated to preventing male suicide. 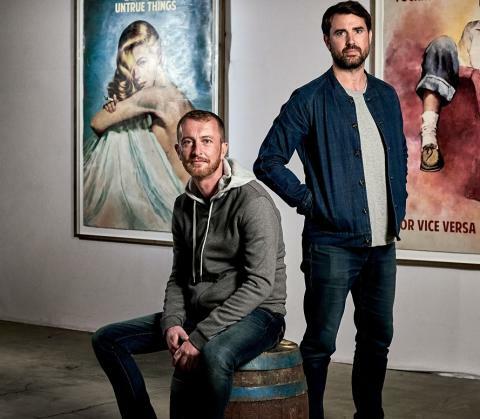 The Connor Brothers – a pseudonym for British artists James Golding and Mike Snelle – will auction an exclusive oil painting entitled ‘We Are All In The Gutter’ at a private view held the Maddox Gallery on 16th May, which falls during Mental Health Awareness Week. Rapper and celebrity fan of the Connor Brothers’ work, Professor Green, will attend the auction to represent CALM as the charity’s patron. 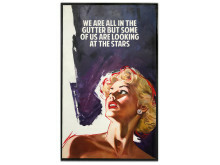 To reflect the statistic that 84 men take their own lives every week in the UK, The Connor Brothers will also release 84 individually signed and numbered prints of ‘We Are All In The Gutter’ on 9th May, to purchase exclusively via theconnorbrothers.com/shop. All proceeds from the auction and the sale of the 84 prints will go to CALM, funding the charity’s vital work preventing male suicide. Professor Green said: “Joining up with The Connor Brothers has been a great process and we’re all similarly dedicated to the issue of male mental health and suicide prevention. To be able to work alongside the Maddox Gallery is a great way to raise money for CALM, the charity I have championed since becoming patron in 2015. As well as starting important conversations around this issue, 84 people will get really nice prints and one person gets a really, really nice oil painting. Good luck at the auction!" 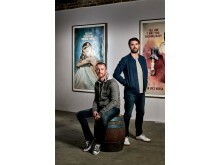 The Connor Brothers have exhibited their work internationally, from New York, Sydney and Dubai to London, Hong Kong and Berlin. Their work frequently appears at major auction houses and in major public and private collections including The Victoria and Albert Museum, The Penguin Books Art Collection and both the Omar Koc Collection and Niarchos Collections. Members of the public who are interested in bidding on the auctioned piece can contact CALM@maddoxgallery.co.uk or bid online here. The Connor Brothers is the pseudonym for British artists James Golding and Mike Snelle. They have exhibited internationally from New York, Sydney and Dubai to London, Hong Kong and Berlin. Their work frequently appears at major auction houses where a record price was achieved in 2016. Works can also be found in major public and private collections including The Victoria and Albert Museum, The Penguin Books Art Collection and both the Omar Koc Collection and Niarchos Collections. One exclusive oil painting of We Are All In The Gutter (2018, The Connor Brothers) will be up for auction at the Maddox Gallery, London. Members of the public who are interested in bidding on this piece can contact CALM@maddoxgallery.co.uk or bid online here. 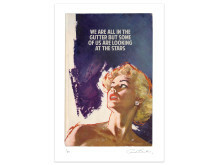 We Are All In The Gutter (2018, The Connor Brothers) edition of 84 individually signed and numbered prints on Giclee print with silkscreen varnish, 41.5 x 29 cm unframed. Available to purchase at £120 via theconnorbrothers.com/shop. Maddox Gallery is fast emerging as one of the most stylish young international contemporary art destinations. Specialising in contemporary and modern art, Maddox Gallery has built a reputation for exhibiting exclusive, cutting-edge art from internationally acclaimed and emerging artists. Maddox Gallery has three London locations, the first a beautiful 3750 square foot Victorian townhouse in Mayfair’s Maddox Street, the second in the heart of Shepherd Market and the third, a 4000 square foot gallery in Westbourne Grove. They recently opened their first gallery outside of the UK in the alpine ski resort of Gstaad. 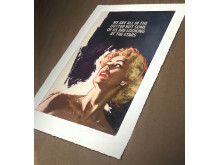 The Connor Brothers exhibition runs at Maddox Gallery from 17th May – 6th June.